On July 21, 2006 I spoke at Detroit’s fabulous Roostertail nightclub as part of the “Can’t Forget The Motor City Reunion 2006.” The occasion was to honor some of Detroit’s classic TV kid’s show hosts. In attendance were Johnny Ginger, Irv “Ricky the Clown” Romig, Marv “Wixie’s Wonderland” Welch and Art “Bozo” Cervi. What follows is a transcript of my speech, a tribute to the man who gave us White Fang, Black Tooth, Pookie and all of the other beloved characters from Lunch With Soupy, Mr. Clyde Adler. Everything I need to know I learned from watching Detroit TV. For example, I learned my ABCs from Wixie’s Wonderland. I learned World Geography from George Pierrot. From Sonny Eliot I learned that the current temperature in Enga-Dinga-Dinga-Dine is 74 degrees and that the Keweenaw Peninsula is right (squeak) here. From Poopdeck Paul I learned the Limbo, a skill I still use to this day when ducking under the turnstiles so I can ride the downtown People Mover for free. Detroit TV has taught me that the magic word is Twin Pines, and the magic number is Tyler 8-7100 for a home improvement date. I probably learned the most from Soupy Sales. Remember his Words Of Wisdom? Always buy thermometers in the wintertime. They’re much lower then. Do unto others, then cut out. Speaking of Soupy Sales, I’d like to talk a little about one of the unsung heroes of Detroit television, Mr. Clyde Adler. 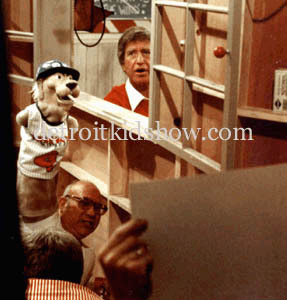 Clyde was the puppeteer behind White Fang, Black Tooth, Pookie, Hippy and Marilyn MonWolf. Clyde was also The Man At The Door. Basically, Clyde was everybody on the show who wasn’t Soupy. Clyde didn’t start out as a performer, though. He was hired as a stage manager by WXYZ in 1949. In 1953 a young disk jockey from Cincinnati, then known as Soupy Hines, was hired by the station to host a new children’s show called 12 O’Clock Comics. Clyde didn’t realize it at the time, but his life was about to change forever. So Soupy decided that on his new TV show he wanted to use his White Fang character. Back then all sound effects were recorded on a record. It was the job of the ET man, which stands for Electronic Transcription, to keep track of the records and play them on cue. 12 O’Clock Comics used a lot of sound effects. Whenever Soupy ate a hamburger for lunch, the hamburger would always “Moo.” Whenever a pie was thrown, you would hear a gunshot, all on records. Now Soupy, whose show was live at this point, says, “Now here’s the biggest and meanest dog in all Dee-troit, White Fang.” Cue the ET man to play the record. Clyde Adler looks to the booth to hear the ET man yell frantically, “I can’t find the record!” Being live television, you have to be quick on your feet. So Clyde finds a live mike and goes”Reh-O-Reh-Oh,” which cracks up Soupy and the crew. The next day a cameraman brings in a White Fang puppet, made by his wife from an old woman’s coat. He says, “Don’t show this to Soupy, just wear it on camera when Soupy does his White Fang bit.” So Soupy says “Where’s my doggie White Fang?” Clyde puts on the puppet, goes “Reh-O-Reh-Oh.” Soupy is on the floor again. Clyde has now been promoted to stagehand-slash-puppeteer. All is going well with White Fang, so it is suggested to Soupy that White Fang needs a buddy, a total opposite of White Fang, named Black Tooth. Where White Fang was the biggest, meanest Dog in Dee-troit, Black Tooth was the kindest, sweetest dog in Dee-troit. Clyde has one free hand, so it is decided that he should be Black Tooth, too. Pookie the Lion, also Clyde, was a puppet that was found in the prop box. At first Pookie was mute and only whistled like Harpo Marx, and pantomimed to records. Pookie eventually developed a voice and a cute Hipster personality. Soon it became apparent that Clyde was more valuable to the show as a performer then as a stagehand. Here’s a quick rundown of what Clyde did on a typical show. Soupy and Clyde went national in 1960, moving to Los Angeles. The show lasted a couple of years, then was cancelled. Soupy moved to New York City, but Clyde stayed behind, working as an engineer at the ABC affiliate. While in Los Angeles Clyde received a letter from Jim Henson, inviting him to work as a puppeteer for the Muppets. Clyde, being a bit shy, politely turned him down. Clyde and his wife Jane moved back to Detroit in 1971, where he returned to his job as technical director at WXYZ. In 1979 Clyde received a call from his old pal Soupy to come back to Los Angeles to tape 13 weeks of The New Soupy Sales Show, to be syndicated around the country. Clyde was as funny as ever, but being a diabetic he had trouble keeping up with the physical demands of show. In the middle of the show’s run he suffered a mild heart attack. 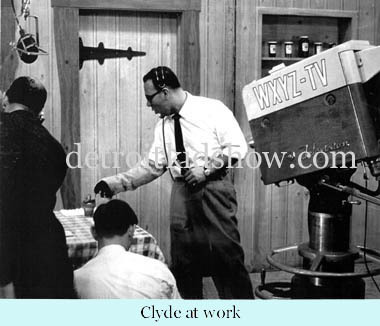 After the thirteen weeks Clyde recovered, came back to Detroit and resumed working at WXYZ. He retired in 1989 and moved with his wife to the wilds of the Upper Lower Peninsula. Clyde passed away in 1993 at the age of 67. Not much of Soupy and Clyde’s work at WXYZ has survived. Most of the shows were done live, and the few that were taped have been lost or destroyed. But I guarantee that if you approach anyone who grew up in Detroit in the 1950s and early 60s, raise your right hand to about here, and go “Reh-O-Reh-Oh,” you will make them smile. So as a toast to Clyde let’s all raise our right hands, and at the count of three go “Reh-O-Reh-Oh.” Thank you, Clyde.